Quiet, affordable cabin in the Pines. Three bedroom, open living room style, on nice quiet street. 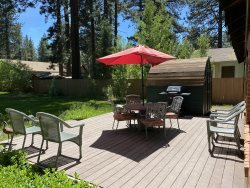 Cabin is close to skiing, golf, hiking and biking. Casino's and Heavenly Ski Resort are just about 5 miles. Cabin is in the Meyers area near the river and close to Echo lake. Nice back deck with charcoal BBQ. Bedroom 3- King bed, Double bed.